This is not a new kit, but it’s been below SMN’s radar, so we’re taking a closer look. 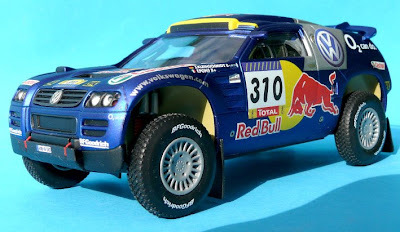 The Volkswagen Touarag is one of the Revell 1:32 scale range of rally racers and since it’s an Easy Kit, all you need is hands and time. Actually, that’s not quite true: a sharp craft knife is still needed for trimming, and you might want to cement some components for permanence. 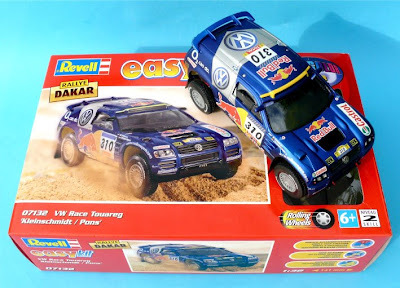 The big advance with this and similar kits is in the markings - the real thing is plastered with sponsor logos, and these are reproduced beautifully on this kit, as is the two-tone blue and silver bodywork. 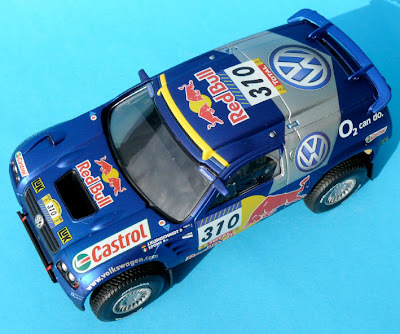 VW badges, hinges, and other details are highlighted, and even the shock absorbers have a three-tone paint job. How about assembly? For the most part, the Touarag goes together like a dream. Only the roll cage gave a little trouble, with a ‘break’ instead of a ‘bend’ on one section - but once clipped into place, it was fine. The only real beef involves the transparent headlamp covers, which simply didn’t fit (though the vehicle looks perfectly good without them) and the windshield wipers, which needed patience and a pair of tweezers to put into place. In the end we just left them off for the time being, as photos needed taking. So what’s in this kit for ‘real’ model builders? Well, it’s like this - as assembled, the Touarag is a perfectly decent little model, measuring 138 mm (5.4 in) long, but that’s just the basis to transform it into a model-plus. If you take some time to detail the interior, pick out panel lines, and add dirt, dust and other weathering, the from-the-box model could be transformed into a real princess. Our future plans for the VW include taking off the body, revising and detailing the interior, smoothing off some seams, then revamping the whole thing to make a Mad Max-style post-apocalypse hunter-killer AFV. It should be good, and there’ll be an SMN report when it’s ready.